Hi there, it’s Birgit here and today I have a fun, simple, and cheap technique for you that would be great to do with kids too! Make sure to check out the giveaway at the end of my blog! I have tried a variety of different felt tip markers - from very cheap to quite expensive, they all work fine. The biggest difference is in the size of the tip. Thicker tips are better for coloring; smaller tips are better to draw finer lines. A combination of different sizes would be best. Other than that, there are no real differences between the brands. You can mix and match them as you want. Printing with felt tip markers is very simple. You just start drawing and coloring on the Gelli Arts® gel printing plate. The inks will not dry so you can take your time. To create backgrounds, simple shapes like circles, work well. If needed, you can clean your felt tip marker by drawing some lines on a sheet of paper. Keep adding colors and lines around and on top of the shapes you started with. When you’re ready, place paper on top to pull the print. It is also possible to print in layers. Start with creating a background, following the previous steps. Then start a new drawing, add some marks too, and print it on top of the first print. Or you can add some (distressed) texture by stamping into colored shapes on the gel plate. From there just follow the steps like before and add more colors, line and marks. I really like the unique texture you get from printing with felt tips, which you would never achieve by coloring on the paper directly. Here are a few tips to note before you begin: Your plate needs to be dry (no wet remaining from cleaning) and not greasy when doing this technique. On newer, very clean gel plates the inks might bead together more. You can wash your gel plate with dish detergent and dry it with a paper towel and it will be ready to go. Test out different markers on the corner of your Gelli Arts® gel printing plate before using. Even if the markers dry on your plate, you will be able to remove the marks with baby wipes. Thank you for watching and please share your prints with us on IG by tagging @gelliarts in your posts! We would love to see what you create! 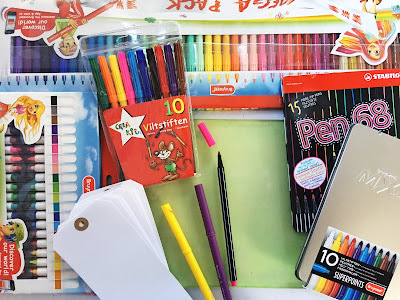 Gelli Arts® Felt Tip Printing Giveaway! Oh excellent. I love the effect with markers. I've used on envelopes before, also fabric markers on a onesie. This tutorial is amazing! Giving more possibilities to create with Gelli Arts® gel printing plate. Gorgeous projects. Thank you so much for sharing it. Gelli plates are so versatile - I am just starting out on my journey and am loving it! Thank you for another idea! pull in the print. You can wipe marks off the plates with baby wipes. Fun. I want to do this with my granddaughter. Es una idea fabulosa! simple y divertida! Looks like a another great way of using your gelli plate. This looks like so much fun! Will have to try. This is a great technique to use with younger students! Thank you! I am wondering if the marker ink would work as a resist if one were to brayer acrylic paint over it. Hmmm … the possibilities! Really need to get a big plate! Thanks for all the posts and inspiration. There is no end to the fun that can be had with a gelli plate! This is definitely a fun way to print with the kids.. less mess for sure! Cheap vs expensive no difference but what about washable vs permanent ? this is great, can't wait to try it out! What a wonderful technique! This is something I can see doing together with my little boy. He loves making art! — Marissa J. Very cool tip. I thought you could only use paint so this opens up a whole new world of possibilities! I would love to have another one for my classroom!! I love love love all Birgit's innovative printing ideas! I have been looking for a technique to get more use out of my collection of markers and this certainly is it. I'm all set up to give it a whirl in the morning. Thanks Birgit, always love experimenting with my Gelli plates. Thank you Birgit for another interesting technique. I love experimenting with the Gelli plate...such endless possibilities. What fantastic results, thank you for sharing. In bed recovering from op at the moment but will be trying this as soon as I am up and about. Thanks for showing me this wonderful technique! Going to try it for a birthday card! What a cool idea! I love the circle motifs (without needing a circle stencil. Just one more way to remain addicted to gelliprinting!! This is great! I'm going to try it with my kids. Way less messy than paint, haha! So many techniques with the Gelli plates. Love these video tutorial. I have tons of markers. Will definitely give this one a go. This looks great. Easy to get out a plate and play without getting set up with paint. I'm going to try it today. That's such a great idea and yet another way to use my Gelli Plate! These would make nice cards for gifts and a unique way of giving love thanks for the share!! Such a cool technique and one I can do with my granddaughter who loves to do art with me. I love this idea! I think this would be a great method for my grands! As always Birgit, you continue to find great techniques for the Gelli plate. Love this one. I love the way the marker just pops off the plate onto the paper. Thank you. Goning to try it. I have a lot of markers. so very interesting. I will have to give it a 'spin' Thanks for the demo and the idea! I will be trying this tonight and then sharing it with the kids I work with next week. Great technique! I’m sure this is a stupid question but do alcohol markers have felt tips? What about crayola markers, washable or permanent? Great use of a simple product like markers to make such beautiful art. The tags are so pretty. Thanks for the opportunity. This is such a great idea! I am sure just about everyone has a few markers around they could try out. Cool technique. I have a lot of felt tip markers. Something new to try. Sassieakadeb is my other login for this event. Great and exciting to see all the different to techniques for the gelliplate! Oh wauw, LOVE this technique. Birgit makes such great things !!! I love this. Keep those techniques coming. Want to try this out looks fun and interesting. Great idea! Have no paint left, so this would be great to try! I liked your post in which you have shared printing goal which is very useful for everyone. Thank you for sharing this post, Keep giving updates so that people can get some new tips.